For an introduction to the notion of being "alive", see alive - introductory. the group is an example of Dragon Eats its Own Tail. That is, the group as a whole isn't one that the opponent, with the move, can forcibly capture. Stones within it may be captured. A group that does not obviously have two eyes, or is not clearly in seki, is still alive if it is guaranteed to be able to get two eyes or make seki, regardless of who plays first. By this extended definition, groups that seem to be alive, or are alive can die if a player is negligent. See pass-alive, also ambiguously called unconditional life. Bill: Moonshine life is not alive under most modern versions of the rules. A certain rare kind of moonshine life is possible under AGA rules, however. empror? : In my understanding, the two-headed dragon ("Dragon Eats its Own Tail") is merely a special case of two eyes. Even though this is a cool example, it just shows that a live group does not need to be solidly connected and can still have two real eyes, as long as every part of the group is adjacent to each of the eyes. This is the same reasoning as for some standard examples of two eyes, as shown in the diagram. Being alive is one possible status of a group, as is being dead; in between groups are called unsettled, or in more open positions weak groups. Tactics for making live groups can combine threats: to make an eye, or to connect. In this example the right-hand white group is alive, with two completely explicit eyes. The following diagram shows that the left-hand white group is also alive. The right hand group is of some help for that. White can answer with for two eyes. here makes a false eye shape, but once White plays all White's stones form one safe, live group. George Caplan "Double ko" is not a life giving status, like two eyes or seki. It is rather a technique to win a capturing race or to connect. Ultimately, the final position will be a group that is seki or has two eyes. It is a means, not an end. Velobici: George you might be right. Thinking about bent four in the corner, it seems that the position is considered dead because at game's end all ko threats will have been exhausted, the ko will be connected forming a three stone dead shape. Is this similar to "double ko", in that "bent four in the corner" is not a final condition but rather the means to an end. Note that Japanese rules adjudicate "bent four in the corner" as dead. In that way it is different, certainly. If the two situations are not similar, please explain. I need to understand this better. George Caplan Not sure how to explain. Look at the diagram on the double ko page. The black stones are not alive because of the two ko's, they are alive because white cannot save the stones in the corner. If the the two kos were against secure white groups, the black stones, with their one eye and "double ko" would be quite dead. My concern is this page confusing a beginner into concluding that a group is alive if it has two kos. This is simply not true. If you are not in seki, or have two eyes, you can have 18 kos, and if none of them make an eye or kill something you are quite dead (eventually). Bent four is not related to this at all. It is simply a position in which, depending on liberties, a group cannot make two eyes. Velobici: Thank you George, your explanation helps considerably. Perhaps the description at double ko is not precise enough: This diagram shows an occurrence of a double ko. (From Large Avalanche Turn Inward). The black group has one liberty (the marked eye) and two kos, giving him always two liberties. This is not why Black is alive. For Black to live, it is also necessary that one of the surrounding White groups share a ko for life with Black. 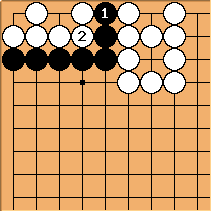 So that if Black wins the shared ko, Black captures some of the surrounding White stones. 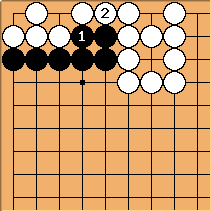 Due to the second ko in the Black group serving as an inexhaustable source of ko threats, White can not win the ko fight for the life of his stones. The shared ko fight shown in double ko is a direct ko. Conceivably, the shared ko does not have to be direct, rather Black play to convert the non-direct ko into a direct ko. This may take more than one stone. Black captures the other ko. White makes a ko threat. Black plays a stone toward converting the shared ko into a direct ko. 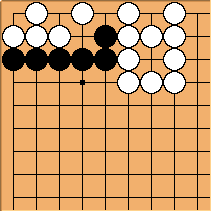 White captures the other ko, but does not capture the Black group. Note: Black requires an additional liberty. On the double ko page, this additional liberty is an eye. Black captures the shared ko. Is this a correct understanding of the situation. George Caplan My problem is not with the description of double ko, the description there is fine. My problem is that, at the end of the day, groups are alive for two, and only two reasons, because they have two eyes, or because they can not be killed due to seki. Any other explanations go into tactics and means and will not aid a beginner to understand the ends. Bill: Yes, this is an introductory page. But it sure doesn't look like one. It badly needs a WME, IMO. (Later.) I have made an introductory page. I think this page still needs a WME, though. RobertJasiek: There are several meanings of "alive". I have stated some of them.